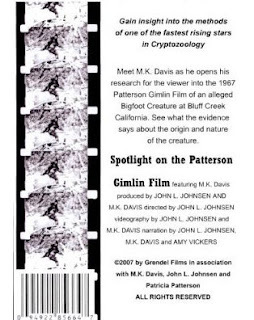 Bigfoot researcher and Patterson-Gimlin Film (PGF) expert, M.K. Davis commented on our recent blog entry on the Port Orford Cedars in the Bluff Creek, CA area, and that contact has led to this interview. It was started November 10th and is still ONGOING. It was done via email exchange. MK DAVIS: Steve, I'd be very happy to do this. My wife quit her job and went to nursing school full time, so my funds did not permit a return [to Bluff Creek] this year. I should be ready when they open it up again. I wish I had fully appreciated what I was seeing, because I feel that I could at least have gotten good photos of the thing [Ed. : this story follows]. M.K. BIGFOOT BOOKS: I have a bunch of things I want to ask, but first, do you mind doing an interview in the manner of a discussion? I prefer to keep these interviews more free-formed and open, rather than simple Q-and-A. If you'd prefer to keep it more brief I can try to manage that, too. As regards the various controversial things, I DO hope you will talk about them; but please know, I am NOT "out to get you" in these matters. Simply, I am thinking that you'd like to speak out and make your case. There are a lot of folks who say bad things about that theory (the so-called "Bluff Creek Massacre"), and by extension you, so it seems that addressing them would be important. My own position is that of an objective journalistic observer of the Bigfoot field. Yes, I am involved, and I have my own opinions. But in an interview I am mainly interested in where the interviewee is coming from. I find you to be an interesting person, and your views are pretty unique, so I'd like to explore that. There are a lot of people whose views in bigfooting are basically "my way or the highway"--but I find those to be counter-productive attitudes. 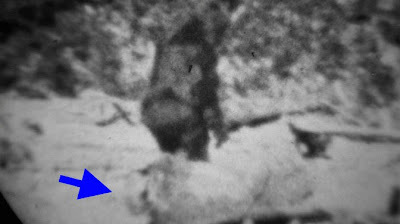 Images: Above, the famous "LOOK" frame 352 from the Patterson-Gimlin Film (PGF); Below, the issue of Daniel Perez' BIGFOOT TIMES featuring M.K. 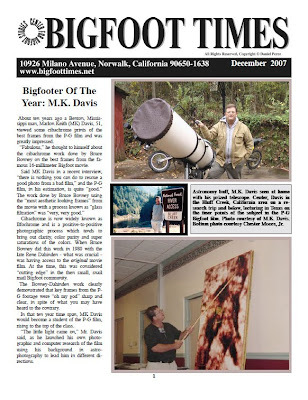 Davis as the 2007 "Bigfooter of the Year," and MK with his telescope. CLICK ALL IMAGES TO ENLARGE. * How did you get into Bigfoot? * Why the PGF in particular? * Do you do "field work"? * Is Bigfoot Human? What IS Bigfoot? * If Bigfoot is Human, why no evidence of culture, tools? * Is Bigfoot flesh and blood, or mystical somehow? * Native American backgrounds--your views on these? * The "massacre" theory--do you still believe in it? Why? * Your current projects, and future steps in bigfooting? * Have you "retired" from bigfoot pursuits? * What else do you do in life besides Bigfoot topics? MK DAVIS: Hey Steve, it sounds like some good stuff to talk about. I do want to be careful about the more sensitive topics. I appreciate a chance to clear some things up, but I am aware of how things can get a little convoluted. 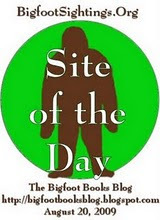 BIGFOOT BOOKS: Well, good. I think personally that it would be good for you to deal, at least a little, with the controversy, as there are folks wondering what's up with you, as you kind of withdrew from public debates at that point. Some are kind of angry. I think an interview that didn't include something on that would be a bit incomplete, you know? I'm not out to attack, nor to discredit you. I just want to know your thoughts, views, and especially where you're heading into the future. I'm not one of those who think that Gimlin and Green are superhuman gods, though I do respect those guys a real whole lot. One thing: if possible it would be great to find new territories that you perhaps might not have spoken about before in other venues. MK DAVIS: I've been looking into the redwoods video from 1997. There are some interesting things in that video, that I think should be considered. I've stabilized the clip and brightened it quite a bit. It definitely deserves more attention, I believe. 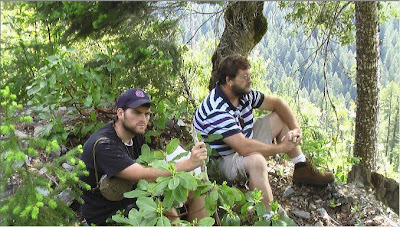 BIGFOOT BOOKS: Let's save Redwoods for later. Question #1, then. MK, I'd known about your work on the Patterson-Gimlin Bigfoot film for years, but I never actually talked to you until this summer. It was a SALAMANDER that brought us into contact (read our previous story HERE). Can you tell this story, and what WAS it that you saw, under what circumstances? MK DAVIS: Here's brief account of the salamander sighting. I'm glad that you asked about it, as I did not record it, and memory fades with time. My Personal Sighting of a Large Salamander in Bluff Creek, Near Orleans. My sighting of a large salamander in Bluff Creek was a bit serendipitous. I had not gone there for that reason, and I had no idea what I was looking at, until the next day, when I saw another, smaller one, up Notice Creek, during a hike in that area. 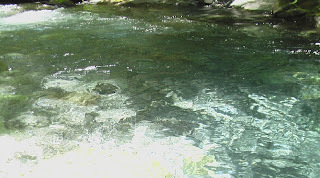 It was then that I realized that, what I had seen the previous day, in Bluff Creek, was the same thing, only much larger. The salamander was in a deep pool that was crystal clear. I could easily see all the way to the bottom. I went to refill some water bottles in the later part of the day, not long after arriving at our camping spot, and when I looked into the pool, I could see it on the bottom moving slowly upstream. I could see that it had splotches or a mottling type of pattern on its back. I assumed that it must be some kind of large fish, as it appeared to be about three feet long. I watched it for a while, and then I went back to the camp, and told my friend Don Monroe that I had seen a really large fish in the bottom of the pool. He told me later, that he had assumed that I was referring to something along the lines of six to eight inches long. He thought that such a length was large for the small stream. He did not investigate. 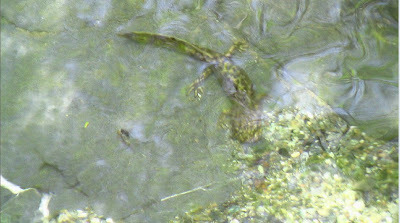 The next day, when we happened upon another specimen up Notice Creek, I immediately recognized the mottled pattern at close range, and instantly realized that what I had seen that previous evening, in the pool, was a salamander. When I told Don this he became upset at me for not being more emphatic about the size. I told Don that in Mississippi, where I am from, the fish tend to get quite large, and when I said large, it was with reference to the size of the fish back there. I know little about the fish in Northern California. There are some fish in Mississippi that require a fish of six to eight inches for bait, so there was something lost in translation when I was telling Don about it. We returned to the pool about mid day and did not see the salamander again. I don’t know where it went. There were rock overhangs under the water, and I speculate that it might have gone under one of those. After returning home to Mississippi, I recounted the story to my friend Roger Knights, who informed me of the importance of finding such a large amphibian there in that area. Roger wanted me to mount an expedition, along with Don Monroe, to try and relocate the salamander again and attempt to record or, perhaps, to capture it. Roger purchased some netting and sent it there to Bigfoot Books, there in Willow Creek, California, in care of his friend Steve Streufert, the owner. I was not able to return again this year, due to obligations here at home, but I certainly would like to find the creature again and get some good photos or perhaps assist in a brief capture. BIGFOOT BOOKS: So, it sure wasn't much compared to a large catfish! But I take from what you are saying that you were unaware of the Pacific Giant Salamander? These are common in the Bluff Creek area; BUT they very rarely get over a foot long--and even then they are shockingly large. If you saw one that was three feet long, then that is a new species altogether! Or it was some freak of nature, perhaps? In fact, it comes close to the old legends I still hear around Willow Creek and from the Hupa People of these monster-sized salamanders supposed to have lived in area lakes, ponds, and streams. They are said to get up to around six feet, and have been said to be capable of eating younger humans! There is a section about them in Cryptozoology A-Z. 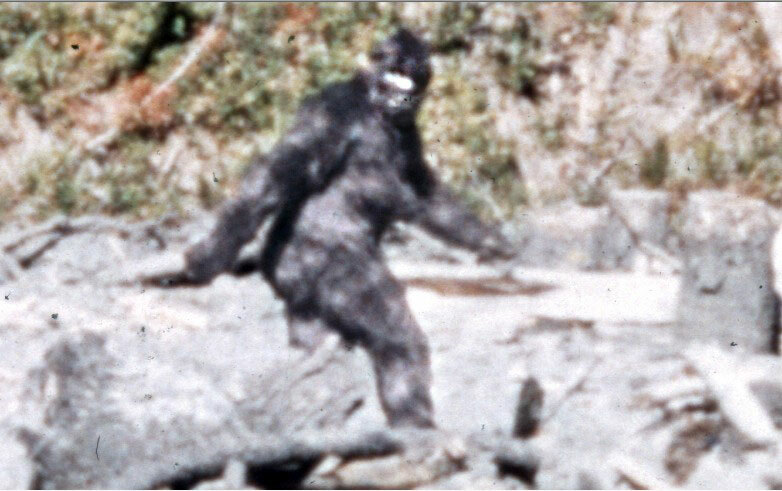 Roger Knights suggested to me that it could indeed have been one of these undocumented giant cryptid species. What do you think? And are you aware that there are known true giant salamanders in Asia? Is the picture you sent of the same large one you saw? How sure are you of the size estimate? Do you think it was a Pacific Giant, or something... ELSE? 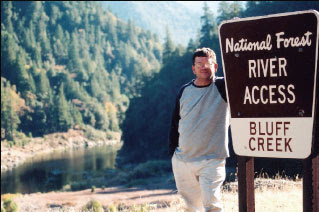 And what was your expedition into Bluff and Notice Creeks all about? I assume you were looking for... Bigfoot? Mostly you are known for film analysis--are you also a field researcher? MK DAVIS: The photo that I sent you was that of a salamander of about ten inches long that I got a very close look at while trekking up Notice Creek. The one that I saw in Bluff Creek, appeared to be quite a bit larger than that. It was at the bottom of the pool however, but the water there was very clear, and I could see the same mottled pattern on it. I was not there for that reason, however, so I did not fully appreciate what it was that I was looking at. We have small salamanders at home, but they stay out of sight mostly. Nothing like what I saw there. Here's a view of the pool that I saw it in. This was taken the next day during bright sunlight. There is a lot of glare in the photo, but on the previous day, later in that day, there was very little glare, and I could see it pretty good. I know a bit more about them now, having had this experience and doing some checking, but at the time, I made a note of it, but did not study hard on what it was. I just wrote it off as a large fish, until I saw the one up close on the next day. I estimate its length at around three feet. It made the second one I saw look like a baby. My expeditions into the Bluff Creek area have been mostly "film" related. It's almost a prerequisite to understanding the film, to actually see the place in person. It was after examining the peculiar nature of the Bluff Creek sand, that I was able to find some of the actual footprints from the film subject, in the film itself, and from there, to find the frames that showed the subject's foot making the print. I am an astronomer at heart, and astronomers are merely trained observers... trained to take whatever the field of view will yield, and to use, develop, and employ techniques to extrapolate as much useful information as can be gotten. Most of these techniques have been around for a long time, and used widely in astronomy. I haven't done anything special with the film that was not already being done in the many disciplines of science. The film has yielded so much, because it is a special film, of a special event. It is inconceivable to me, that a staged event would produce much more than that which was planned for by the stagers. The sheer volume of data, yielded from this film, strongly suggests a live event that was not under the control of the filmographer. What I have seen on the film, leaves little doubt, in my mind, that we are all peering into history, when we view it. Images, most courtesy of MK Davis: above, at the Bluff Creek and Klamath River confluence; below, with son Bryan up a creek off the Creek, on a recent expedition. When I last ventured into the area, it was at the request of my son Bryan, who wanted to see the area for himself. He is a journalist and a history major in college. I feel strongly that this area, for whatever reasons, continues to be a better than average place to go and look for such things. I don't know if it's fair to call me a researcher or not, but I do try hard to acquire first hand knowledge. I gather raw data, and make observations that can be later used in problem solving. I have done this at my own expense, but not without help from many interested ones who have extended themselves to get me into these places and to help in many other ways, and I am indebted to them. They know who they are. BIGFOOT BOOKS: Re. the salamander—it is too bad you didn't capture the BIG one on film! Did it look really similar to the normal-sized Pacific Giant Salamander that you saw the next day? If so, one has to really wonder. Three feet is totally beyond accepted sizes for the species. The ten inch one was an adult, more or less fully grown size. And, how sure are you of that size? I'm assuming your astronomer's eye took into account the depth of the pool and distortions of light through the water, right? Let's hope next summer's expeditions can find another one! The capture nets are waiting for you here in the shop. Now, re. bigfooting—how did you get involved in the Bigfoot subject, and WHY Bigfoot? What in your personal background led to this interest and all the work you've done in this area? How big a part does bigfooting and Bigfoot research now play in your life? And could you tell us a bit by way of personal biography and career history so that our readers may know where you're coming from in life? And, is your son following in your footsteps in some regards? Who besides Don Monroe are your research associates or group affiliations? And, re. Bluff Creek—I feel that this area is beautiful, and very mysterious. It is the area, “in my backyard,” where I tend to go to explore and enjoy nature. I don't always know if that is because of the legend of the Patterson-Gimlin film, the Jerry Crew track finds, or what; but I do feel that the mystery persists. 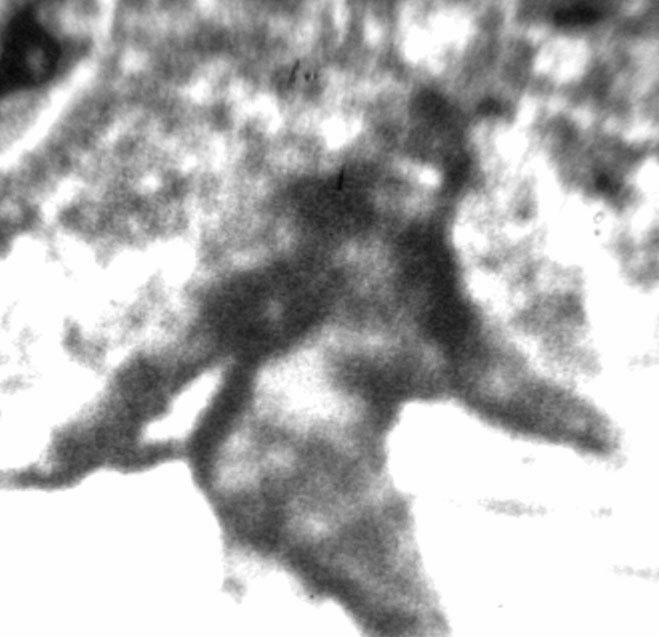 Do you view it this way, or is any old place where Bigfoot might live equally fascinating? Image: Says MK, "Here is an example of the high quality of the film in its original format. This is only a screen capture of the image. It is truly a very large file and is in pristine condition. I'll get into how this kind of quality exists side by side with some very bad stuff." MK DAVIS: I am aware of the refractive qualities of water. I used to bow-fish in the shallow sandy bottom creeks near home. In order to get a fish, you had to know about where the true location was, compared to the refracted image. However, this was in shallow water. We do not have this type of depth, combined with this type of clarity. I was looking down on it at a steep angle, so the refraction wasn't that great. It was on the bottom, but the water was extremely clear. I could see that it had an unusual mottling pattern on its back. It appeared to be about three feet long, down there on the creek bottom. I could see that it had appendages, but my mindset was that it must be a fish of some kind, so I just assumed at the time, that these must be fins. That's the only thing that I have to go by, since I haven't had any experience with pools that deep and clear. If it could be netted, I guess we would know for sure. Image: Says MK, "The quality of this transparency cannot be overstated. Very basic features are discernible here. In this enlargement filtration is used along with contrast boost to reveal the true face of the Patterson subject." 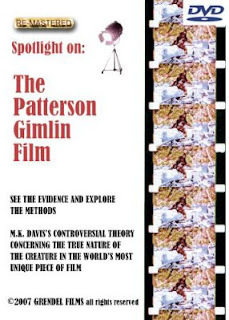 My involvement in Bigfoot and Sasquatch research, has largely been a singular effort, mostly involving the Patterson film. I don't think that I had anything more than a passive interest in the subject, until I saw some very clear images from the film. I knew, from my experience with astronomy, and "astro-photography", that such stunning images could not have come from "blurry" film. I knew that there must, somewhere, be a very good copy of this film, and that if I could find it, I might be able to resolve the issues surrounding the Sasquatch, using the film itself. This is not to say that I have not had help and assistance in this. A singular effort means that I had engaged the problem of the film on my own terms, and I was prepared to go where the film evidence dictated. I wanted to apply my own knowledge and experience to the film, and not be subjected to outside influences that might have served, in the past, to render it indecipherable. Getting access to these apex images would be the key to understanding it. My background is a simple one. I was born and raised in the area where I now live. I have always been interested in science and nature. I am married, and I have four grown children. My wife and I have been married for 32 years. I own two large telescopes that are outfitted for photography. I have used these scopes to pursue astro-photography for a number of years. I have had a long career in industry, and I currently work in the chemical industry. Image: Gluteus Maximus musculature quite evident in the film. Do these buttocks look like those of a man in a suit? I have been "cold-trailing" this film for quite a few years, and like I said earlier, this has largely been a singular effort. Like a good bloodhound, however, once the scent trail has heated up, the slow bloodhound is replaced by the faster and more heads-up walker hounds. From this point on, the outcome is inevitable. My sons are interested, but I think that they will probably make their own tracks upon this earth, and not follow in mine. I hope that this is the case. 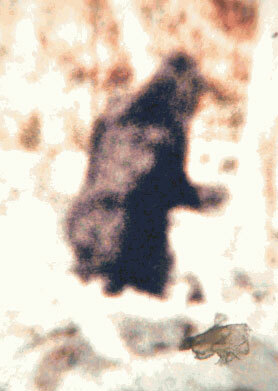 The Bluff Creek area is certainly, as far as I am concerned, "ground zero" for Sasquatch. When I say "Sasquatch" I mean the PNW typical of what is on the Patterson film. The term, "Bigfoot," although originally coined in the PNW, has become a more generic term that encompasses almost anything unexplained, that makes a large track. 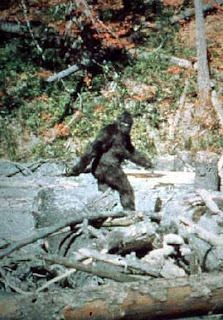 The term "Sasquatch" is, and always has been, a large hairy human. My friends from other parts of the country, and in many parts of the world, tell me that what is on the Patterson film, is very different from what they see, or have seen. I take them at their word. So...the bulk of my attention has been on the PNW Sasquatch, of the Bluff Creek drainage. An area that I have come to know and appreciate, as you have, for its mystery and beauty. BIGFOOT BOOKS: So, we can take it that your view, used to making fine distinctions in astronomy, for instance, would not be inclined to see things that are not there. A three-foot salamander seen by MK Davis, then, is going to be more or less a bit a three-foot salamander, right? Image: The foot, by the arrow, showing the mid-tarsal break flexibility of the Bigfoot/Sasquatch foot. And re. Bigfoot: I take it, then, that you did not have a particular obsession with the phenomenon, but rather just found it an enigmatic challenge of analysis? 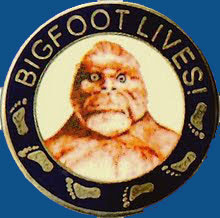 Bigfoot didn't have some great mysterious appeal or meaning for you, like it does for some (like it does for me)? Regarding the film, what copy or copies of the P-G film have you worked with, and what was their source? What generation of copying do they come from? As I know you know, copying of a film can result not only in the degradation of clarity and color and such, but also can introduce new elements such as grain, film imperfections, scratches, dust, possible distortions or minute additions to the images. I'm wondering if certain things that are seen by some in a particular copy of the film could perhaps not be there in another. One fellow in particular rose up in the YouTube rankings for a while with a series of “Patterson Bigfoot Film Debunked!” postings. 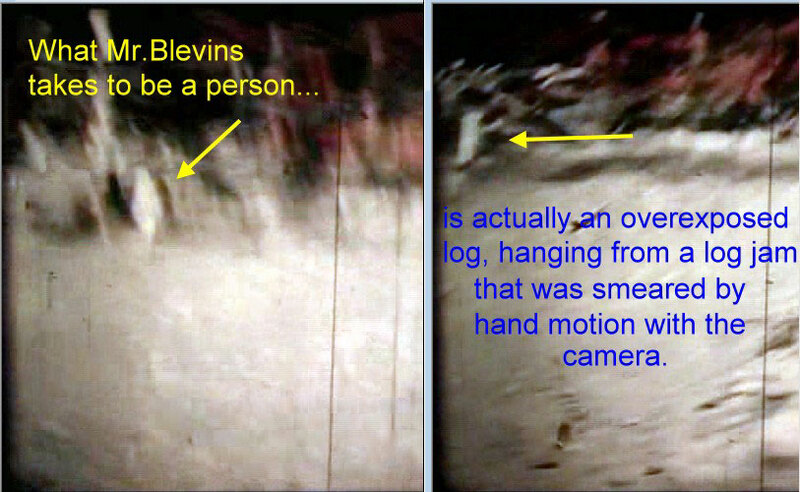 This Leroy Blevins claims to see “hats” entering frames, “men” present on the film site ground that were later removed, horses standing in the background, “Bob Gimlin” sitting in the trees behind the film creature, secret film splicings, etc. He uses all of this “evidence” to try to discredit the film and its makers. He also claimed, in lengthy conversations with me recently, to have somehow influenced the direction of YOUR own research. Do you know him, or of his works, and what do you think? Contrary to this, your own work seems to have decidedly reached the conclusion that the creature/hominid (whatever we call it) is REAL. How sure are you that it isn't a man in a suit, and what in the film convinces you of its veracity? Your original renown in the bigfooting world came from the incredible stabilization work you did on the film, allowing us to really see the creature without all that bouncing around of the camera. That work was just in presenting the film subject, not in INTERPRETING what is seen in the film. But since then you've come out with ideas and theories of what is IN the film. Now, I have to say, when I view the film, and I mean just watching it without any special enhancing software or frame-by-frame capability, I don't see all too much in there but for a creature walking on a sandbar, one that looks very real to me, and not like a regular-sized human in an ape suit. You've been known for finding a lot of special kinds of things and features in the film, including some that suggest the creature may be more human than ape. Can you talk about this, and how you found these things in the film? And how sure can we be that these things are within the resolution levels and capacity of the 1960s 16mm Kodak film, and not just distortions of the film stock itself or later copying flaws? MK DAVIS: Light will slow down by about 1/4 when entering clear water. As long as the surface is flat, it will produce image shift, but not much in the way of magnification. The surface would have to be a parabola or a hyperbola in order to magnify. This does not mean that interpretation cannot be in error, it certainly can. The three foot estimate, is just that...an estimate only. Give or take some, but I feel pretty sure that it was a genuinely large specimen. Re: Bigfoot. Not an obsession, initially, but fodder for a curious mind. I thought that if the film were to be real, then the film and the subject itself would be manifestly important. Once I began to work on the film, using quality images, it became very apparent that I was looking at something living and natural, and not a man in a suit. Bad copies of the film have done the film a great disservice, and until recently, that was what was mostly available to the public. There are a lot of documentary film makers that claim that they worked with the original, but according to my information, that could not be correct, as the original was supposed to have disappeared some time ago. Every copy of the film has something to offer to the analyst. This was originally a "positive" film, i.e. there was no negative. It was developed as a positive, and reproduced as a positive. When a positive image is repeatedly copied, it builds contrast. In other words, the darks become darker, and the brights become brighter. This can be observed in many copies that are claimed to be the original. The sand bar appears to be white. You know that in that area the sand is very dark when wet, and is a blue-gray tone when dry. The original or a good copy should show the true color of the sand. I have worked with good film that does indeed show this sand to be a blue-gray, so I know I was close to the original. The original film stock was a very good theater grade stock called Kodachrome 2, that had some very complex developing issues, that I won't go into here, but required some special expertise and equipment and chemicals. This translates into time, and there was not enough time to have had this done conventionally, according to the timelines given of the event. So...while the film thrives, the story line suffers from its own flaws. The various copies also have various degrees of cropping applied to them, mostly to make the film subject appear larger. This, however robs the analyst of hard data that is contained in the periphery of the film. I have worked with transparencies made from the original film, that do not suffer from the vignetting that is found on a lot of copies. Vignetting is a distortion around the periphery of the frame that is a lens defect and is exacerbated by copying. These transparencies are sharp edge to edge. I'll attach an example of their quality. The various copies also suffer from chromatic aberration. This becomes more apparent when magnifying the image, and can largely be corrected for with filtration. The black and white stabilizations that you were referring to were not only hand stabilized, but each and every frame had the chromatic aberration corrected for, before reassembling the film in its stabilized form, this contributed mightily to the amount of detail that was seen in the stabilizations. It was all very labor intensive. As far as Mr. Blevins and his work, I do not know him. I have not had any affiliation with him. I have not shared anything with him, nor him me. I did see some of his YouTube postings, and I do not agree with him at all on his findings. I looked into some of his findings that were posted and found that most, if not all, did not agree with what I had on film. 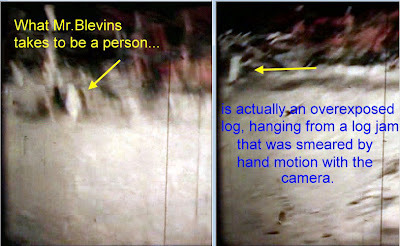 Mr. Blevins, as far as I know, does not have quality images to work with. The better images usually prevent this kind of thing from developing. I tend to look askance at people who refer to themselves as the best, or the greatest, because I believe that this film should be looked at completely neutrally, without a view of how it might be a vehicle to take someone to some sort of level of greatness. There are no pontiffs in this business. I'll attach a file that demonstrates how Mr. Blevins was incorrect on one of his assumptions [see above], and there are many more. I do, however, wish him the best; but he should be aware that there are very good images and versions of this film out there, and that being said, the film tends to be "self-correcting", when properly observed. Regarding the "humanness" of the Patterson film subject: The possibility of humanness has always been there with the Patterson film. The film subject walks upright with the basic biomechanics being the same as "human" as we know it. Due to the quality of the film available to most scientists who have tried to look into the matter, there has always been a question as to the nature of what we are looking at on the film. My goal was to get the very highest quality images from the film, and let the film tell its own story. What I found on the film, does indeed point strongly in the direction of the film subject being a human. This is not to say that she isn't strange, but rather, there has been nothing that "disqualifies" her from being human. There are, however, certain features that, once I found were there, are profoundly human in nature, and not a man in a suit either. The first such feature that I was to find on the film were features on the face,the lips in particular. The film must be exhaustively advanced frame by frame, until the synchronicity between the filmogrpaher and the film subject are aligned, and the lighting good. This occurs as she is beginning to look back towards the men. [See photo.] 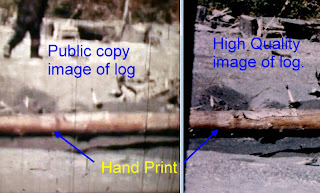 The image on the left is the "raw" image from the film. The right has been filtered. This filtration is the same technique used to filter the sun and planets in order to see the different wavelengths of light. If very subtle lips can be made to more dominate the image by splitting the two very different light wavelengths and then boosting the diminished tones. It is not in any way "adding" anything to or taking anything away from the image. It is simply making the more subdued tones dominate the image. This is called enhancement. When I was able to get access to the transparencies from the original film, I was able to confirm that [this] image did indeed contain the the lips of the individual, and those lips were of a "full" nature and appeared human. When the two frames are animated then a flexible, dynamic mouth becomes apparent. While following the film frame by frame, I could see that the hair on the side of the head was quite long, and was blowing in the wind. I followed it until I saw it blow forward, over the ear, and there was the ear itself, in plain view briefly until the hair fell back over it. The ear appeared to be of normal proportions. There was nothing "non human" about it. 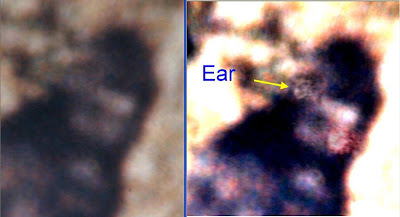 If the viewer looks carefully at the raw image on the left, the ear can be seen without the aid of enhancement, but much better with it. The skin of the subject is of a different tone than that of the hair. The hair is very light, and is easily penetrated by the sunlight. The sunlight reflects off the skin and back through the hair. This essentially creates two reflective surfaces that are of two different tones. These tones can be split apart and the two tones treated independently of each other. By doing such, I was able to turn "down" the tones of the hair, and boost the tones on the skin. I did such to all the images where the sunlight was striking the back directly, and when I animated the sequence, the muscle movement along the back and spine and gluts became much more obvious. Here is a file that demonstrates this. Again, this was very laborious. The gluts can also be seen to move independently of each other.... There are many more files to consider that I don't have time for here, but I think you can see my point that, the question of whether this is a man in a suit can be solved with the film itself, and leaves little room for argument. BIGFOOT BOOKS: MK, what were the origins of the source film materials you used and what software do you utilize? Patty/Bigfoot may indeed be on the hominid branch of the primate tree, but "human"? Unless one has a pretty darn flexible idea of what is human, I'm not sure this makes sense. To me it is like a gorilla sitting around asking, Are orangutans gorillas? No, but we are all related. Humans are apes, too. Genetically, Sasquatch and Homo Sapiens are obviously quite different. If we put Patty on the streets of a city I'm not sure anyone would mistake her for human. Evolutionarily, there is no reason that bipedalism could not have evolved in two separate lines--I mean, look at dolphins: they evolved fish-like form completely separately from fish. It is function and survival success that causes this parallelism, I think. If they were "human" like us don't you think we'd find at least SOME cultural and tool artifacts from Bigfoots? So far we have sticks and stones, and a few beds. The Bigfoot may indeed be a "relic" hominid, and may indeed be very close to us. Homo Erectus, Robustus, etc., yes, maybe. But, then again, evolution is strange that way. All dogs are wolves, basically, but LOOK at them, they are highly variegated. We humans are apes, but cannot interbreed with gorillas. The ape family contains, I'd say, variations on a theme. Based upon lifestyle functions, traits persist and develop. We went down the upright walking, hunting and gathering line, as it appears has Sasquatch. Our problem in looking at this question is, I think, due to our general view of ourselves as exceptional, as if we are not apes--but basically, we are. We seem incapable of really conceiving of ourselves as an evolving part of the animal kingdom, so it distorts our views of the other creatures in our world. This possibility of interbreeding is intriguing. The local Northern Californian tribal groups speak of this stuff, and not too far in the distant past either. There are women here in my area who are still afraid to go into the woods for the fear of being abducted by the Hairy Man. That would indeed suggest that we are very close indeed to the Bigfoot genetically, especially if viable offspring can result as has sometimes been reported among tribes like the Hupa (as covered recently in Paulides' The Hoopa Project) And I don't mean the kind of thing one hears about in the Weekly World News! It is odd, but a great dane can breed with a chihuahua, so go figure. The details you reveal in the film are amazing. The ear, lips, muscles, head movement all suggest not just authenticity, but yes, a very human-like quality to the creature. I'd argue that she is obviously evolutionarily CLOSE to us, but you seem to be going further than that. To me, being “human” is more than just genetics. It is about how our genetic basis expresses itself in evolutionarily-advantaged and exaggerated higher brain function, tool utilization, culture, aesthetics, social organization, technology, language, etc. Even so-called “primitive” societies living in the wilds have really quite elaborate cultures and survival technologies. We have lost a lot of the “animal-like” qualities that apes have, that our ancestors had: the fang-like canine incisors, the brow ridge, the sagittal crest, the hairiness. Patty does have more of these features than we do. So how is she... human? Do you mean to say that Bigfoot is a literal human, or just some parallel human-like hominid form? What other things do you see in the film that would weigh in on the human side of the equation? 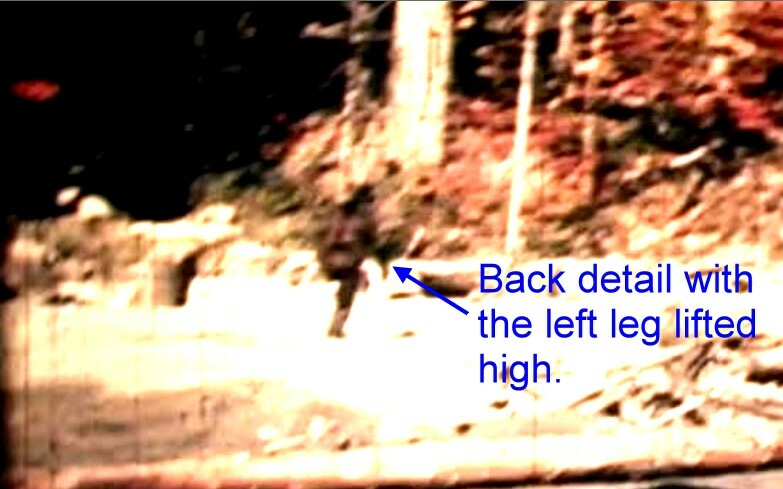 I read in the Bigfoot Times that you see Patty carrying a digging stick--is this the kind of thing you are finding? 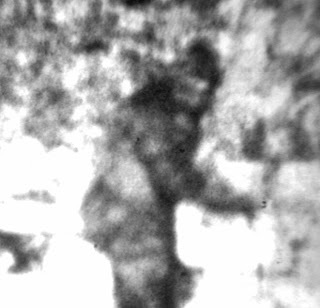 Does Bigfoot have a... CULTURE, and not just instinct? You made the analogy of yourself to a “bloodhound” in regard to the film—what is it that you are tracking down? What exactly did you mean by: “From this point on, the outcome is inevitable”? 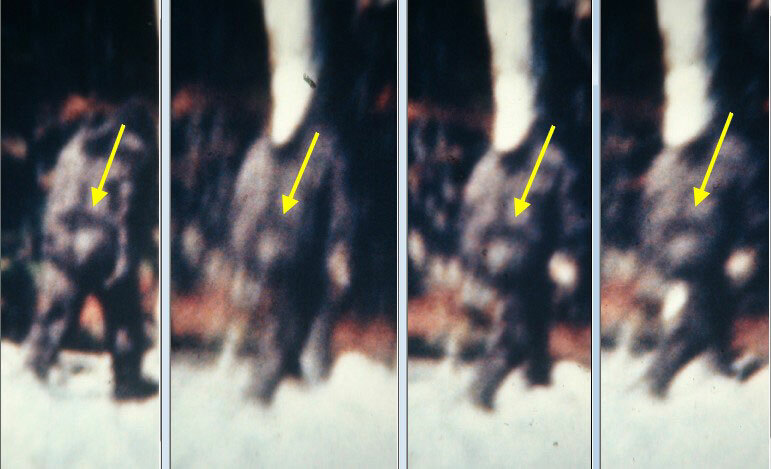 Images: Full neck movement and human-like arm swing... evidence that Bigfoot is of the Homo line, not the Simian or Pongid? MK DAVIS: Based upon the Patterson film alone, there is nothing that "disqualifies" the Patterson film subject from being human. The excessive hair is abnormal among humans, but not unheard of. When the images from the film are examined it becomes apparent that the hair coverage is very light indeed. There are examples of humans with the various traits that are seen on the Patterson film subject, however, there are no examples of upright walking apes, living in a montane environment. This alone tips the scales in favor of human. This is not to say that she is recognizably normal by any means, but I don't know how unusual a human can look when the populations get low and consanguinary relationships begin to develop. I know that this can cause some startling defects genetically. The Hoopas [ed. : "Hupas" is technically correct] have told me that in years past, they used to trade with them. They conversed with them and actually traded goods with them. They told me that, by and large, the Sasquatch were untrustworthy, and were considered "rule breakers." The Sasquatch were said to raid the nets of the Hoopa and were pretty much lawless. 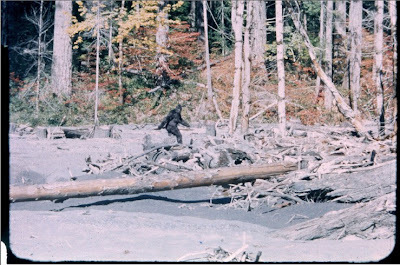 If that was the case then, I wondered, how do the Sasquatch handle such a cold environment with little or no clothing? There again, there are examples of this. Down on the tip of South America there used to live (and some say there still are) a tribe of people that Europeans came to call Yahgans. This area of the world had precipitation for 300 days out of the year, with most of it in the form of ice of freezing rain and snow. These people would dive for clams in 35 degree water, with hardly a shiver. 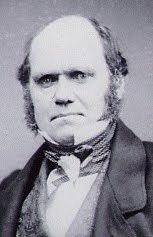 When Charles Darwin weighed anchor offshore from the Yahgans, a group of them came out in canoes. Darwin [see "*" quotation from Darwin, below the interview] said that there was a woman in one of the canoes who was suckling a baby, and both she and the baby were naked and exposed to the freezing precipitation. The precipitation was falling so hard that it was building up on her and the baby, yet, to them, it was like a day at the beach. The Yahgans also had very unusual feet. The toes were almost as long as the fingers of the hand, and they were known to grasp, and hold on to rocks with their feet, to keep the gale force winds from blowing them down. See the attached photos of a Yahgan family. Incidentally, the true name for the Yahgans was "Yamana." It was the Europeans that gave them the Yahgan name. At times in the past, the low position of the Patterson subject's breasts has been an issue for debate. Observe the position of the breasts there on the Yahgan woman. 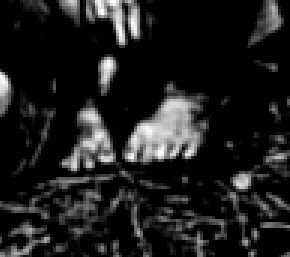 Image: The strange, large,long-toed feet of the Yahgan/Yaghan people. Above, showing them in their natural state. Tragically, only one full-blood member of this tribe survives today. The majority died from contact with European diseases, often caught once they had put on clothes for the first time. I mentioned earlier that there were two reflective surfaces on the Patterson film subject. One being the hair, which is thin and wispy. The other being the skin itself, which is of a lighter color than the hair. The sun strikes both surfaces, i.e. the sun penetrates the fine layer of hair, then reflects off the skin and back through the hair and to the camera lens. This is why the muscle movement is so easily seen, because the hair does not obscure "totally." Here is an example in the attached file called "Backhair pattern." There are many places, in the film, where the sun strikes the subject's back in such a way that the skin is visible beneath the hair. Here are some samples in the photo attached called " Back detail collage." There are many more as well. This level of detail is best seen in the higher quality versions of the film, which I have been privy to. I cannot, here, divulge the sources of the film that I have and have worked with, but I have seen and worked with the very best. Let me digress a moment back to the subject of humanity. I hoped to make the point that the human genome contains, within its make up, the potential for variation. The human genome has been said to be "The treasury of human inheritance, and a vast dump or recycling center" (from Medicinenet.com). The word "homo" has been around for a while, but the sapiens part is fairly recent. Science has hunted for the proper word to accompany the homo, that would describe the entire family of mankind. Sapien means "Wise," so...homosapiens would be "wise man." I am open to the possibility that these ones called Sasquatch may not be that wise, but we've all had our moments. If these are not sapiens, then they are certainly not simians either. Then...what are they? Perhaps "Homo Exotica." My mind is open. It's pretty clear that this is not a man in a suit, isn't it Steve? You're a smart guy, you know what you are looking at here. Whatever kind of woman this is, she is living naked and in the wild. It has been a privilege to work with this film. These kind of images do not need a lot of explaining. No complex, scientific formulas, no indecipherable jargon. It is a good photographic record of a living being, and it shows in the film so splendidly as in these images and many more. MK DAVIS: As far as culture is concerned, if what I can gather from Native American accounts is true, there is a rudimentary type of culture among them. We really do not know if they use fire or not. It is not prudent to assume they do not because we do not find any of the remains of their fires. The reason that I say this is that it has been documented that, among primitive peoples, certain ones are skilled at producing fires with little to no smoke, by careful choices of wood types. Ishi, the last wild Native American to come in from the wild, stated that he lived in a ten square mile area, surrounded by settlements, and was never detected, because he only burned low-smoke wood types, and then covered the fire over with chaparral bush to absorb the little smoke that was produced. This same thing was observed among the primitive peoples of the Amazon basin, on a recently aired documentary by National Geographic. The primitive people were encountered on a river bank, and when they ran off, the fires that they had cooked with the previous night had been carefully hidden. Tool types among the most primitive, can be something as simple as a stick, or rock. The Yamana, or "Yaghans" spoken of earlier, were very proficient rock throwers, and many of them could get dinner with a well aimed throw, even hitting birds in the air. If the Sasquatch did raid nets, if they did converse with the Hoopa, if they did trade with the Hoopa, if they are human although rudimentary and primitive, then some culture must exist among them. BIGFOOT BOOKS: Well, I'm no biologist, but if the DNA of gorillas is 98-99% identical to human DNA (and look at the difference! ), then perhaps we are splitting a few too fine hairs here. I'd let it suffice to say that we are all related, the primates, and that without cultural-species bias the human race and its antecedents and relatives are all part of the same family. 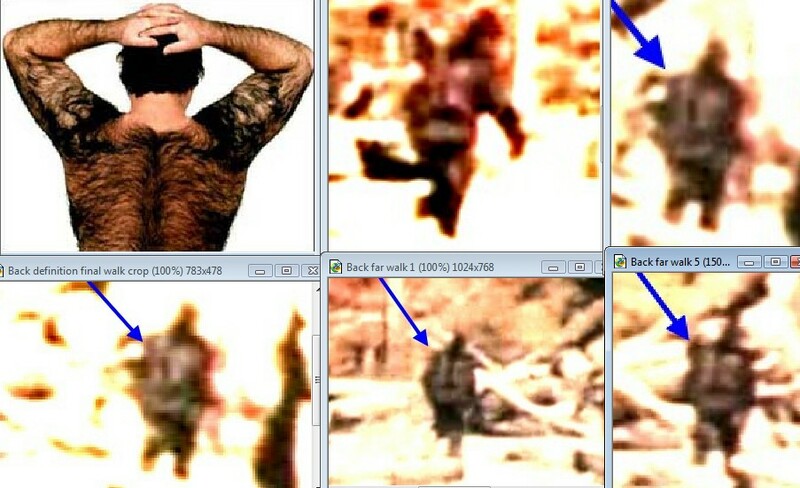 Clearly, from what you show, the Sasquatch is not strictly an ape, as we know them. It isn't a chimp, an orang, a gorilla; but nor really perfectly aligned with homo sapiens. BUT, we are all members of the biological family, Hominidae. As you know, early forms of homo- emerged from the same ancestors as apes, some dying out while others survived to evolve into the currently evolving human form which has come to dominate the planet. There is clear evidence that early hominid forms sometimes co-existed with each other, even perhaps retaining the capacity to interbreed, as is speculated with Neanderthals and modern humans. Is it possible that a branch like Homo erectus or Homo habilis persisted, and continued to adapt and evolve? Bigfoot seems to be clearly close to the homo- line, though from what segment and how closely related to us has to be determined, I'd say, when a body is found. You may be right: this creature/being may be a subgroup that diverged at an earlier stage from the recognized form of homo sapiens, still basically "human," but remaining wild where we became civilization-adapted. 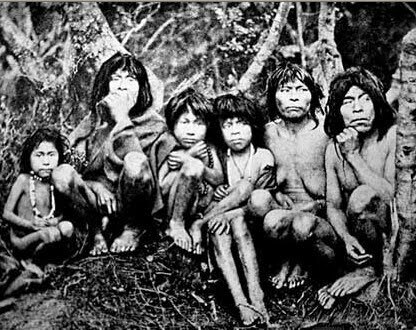 Civilized, socialized life clearly has altered and is affecting the development of our branch of the hominid species. I would not rule out the possibility that inbreeding or isolated development could be the cause of Sasquatch's height, big feet, hairiness, etc. But, these are adaptations that have allowed it to survive, or they would not persist. Survival conditions for them are clearly different than they are for us. Hirsutism in humans does exist, and is probably a remnant of the gene expressions and hormones from when we needed that hair. I've read that we have essentially the same number of hairs as apes, but ours are just not as long and thick. 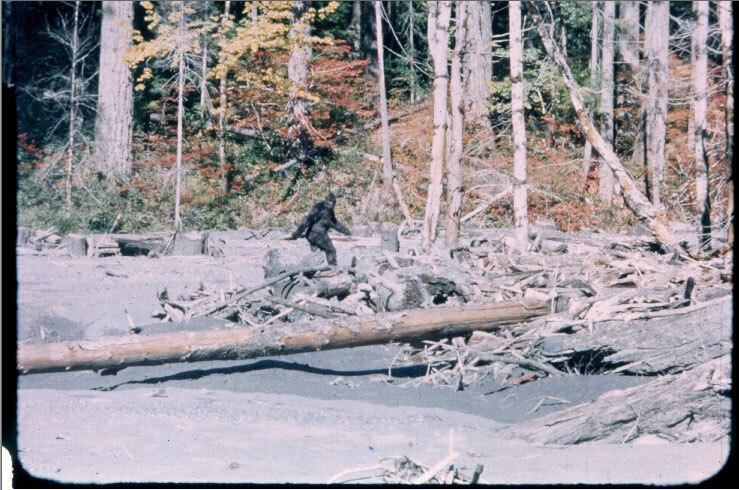 With the Sasquatch being a self-segregating, reclusive and mostly non-interactive species, their own distinct qualities can be seen as particular to them, even if they may be called hominids rather than hominoids. There are a few questions that occur to me at this point. 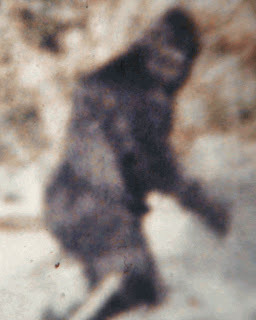 First, how well does the PGF represent the Bigfoot as a species? I mean this in regard to the difference you mentioned earlier between the PNW Sasquatch and the regional variants such as the Skunk Ape that seem, well, much more animal and ape-like. How might this difference influence your opinion of their human-ness? On another hand, one of the strongest and most commonly used proofs used to claim that the PGF is NOT a hoax is that it COULD NOT have been a hoax, as the creature is so large, ape-like, walks differently from us, varies greatly anatomically, is more bulky than any human, etc. What do you say to that argument? Could there be more that one species of hairy biped on this continent, one being human-like the other more an ape, basically? Maybe these are diverging sub-groups? And, if Bigfoot IS human, with all the brainpower we have, they MUST have culture, right? I mean, what would they DO out there in the woods save for mere survival? And in regard to the Native Americans, it is mysterious--what do you make of the tellings of interaction, language and such when set against, say, the old Dzonokwa tales that make Sasquatch out as a giant ogress/ogre with supernatural powers? One still hears these views, that the Bigfoot were "Stick Indians" or "Indian Devils," or as David Paulides put it recently, a "tribe." But they are also seen as spirits, demons even. What can one take from a tradition that at once claims extreme human-ness and yet metaphysical and supernatural powers? Last June you sent me an image of Patty that suggested she had a braided top-knot of hair, not a pointed sagittal crest. Do you still hold with that idea? 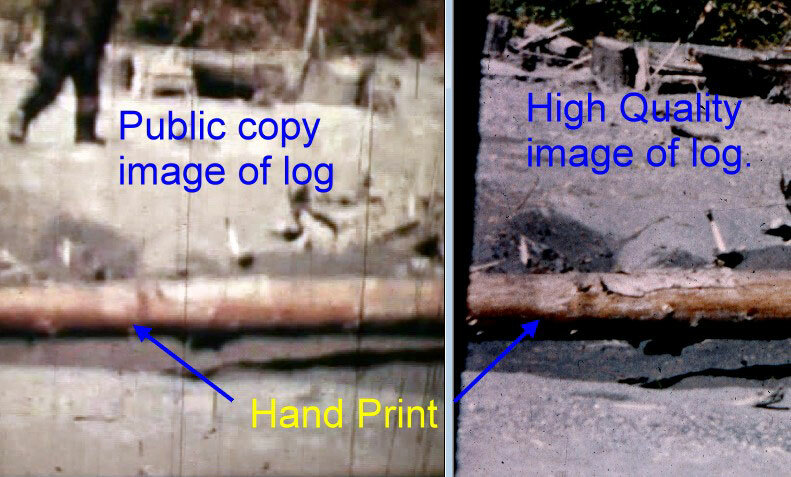 And, since you just mentioned it--WHAT is the significance of that HAND PRINT on the log, in the photo you attached? How did it get there? What is it from? What is it made of? And why is it there? MK DAVIS: I know that much has been made of the "closeness" of the simians to humans genetically, especially the chimpanzee, which is said to be 98.4% genetically human. The complexity of genetics must be accounted for, however. A lot of people tend to look at things in the most simplistic of ways. With a number like 98.4%, they must be nearly human...right? Well...not if the other remaining 1.6% are a prerequisite for being or having the ability to behave as a human. There was a chimpanzee that took nearly six years to learn to crack nuts with a rock. This particular chimpanzee never was able to teach any of the others in its group to use the rock. This is my point, while much has been learned about genetics in the past 100 years, not nearly everything is known, and the importance of chromosomal information is not uniform across the board. That 1.6% appears to be essential in being able to put intelligence to work, which is a human trait. Oddly enough, a chimp of such limited ability, seems to have no trouble picking up the habit of smoking, which is common in zoos that still keep chimps in close proximity to people. There are other biological uniquenesses in the simians, especially the gorillas, that might be a barrier to such a cross over. While the chimp can and does eat meat, the gorilla is a strict vegetarian. The stomach of a gorilla is distended and is tailor-made to digest very rough vegetation. The gorilla will sometimes catch its own excrement and eat it, in order to get a particular vitamin from it that could not be broken down with one pass through its system. Hey Steve. It will be a bit touch and go for a day or so, until the holiday is over. I still plan to touch on the humanity/culture question some more, if you don't mind. Please be patient, and have a safe holiday. M.K. BIGFOOT BOOKS: No hurry, really. I'd say that we're about 2/3 through the interview, unless you have any other issues to raise. I'm glad to go on forever talking about this stuff, if need be. Re. culture: to me it is the real sign of human-ness, as all that higher brain power just HAS to go somewhere, like into aesthetics, religion, philosophy, science, music, etc. A big, human brain out there in the wilds might run out of things to "DO," you know? I often wonder about the intelligent animals. Like, what does a whale think about? What is the inner life of a gorilla? Etc. EDITOR: AT THIS POINT MK HAD TO TAKE A THANKSGIVING BREAK, SO WE HAVE DECIDED TO PUT OUT THIS INTERVIEW IN TWO PARTS. CHECK BACK IN A WEEK OR SO AND WE SHOULD BE DONE WITH AN EQUAL LENGTH OF MATERIAL. "While going one day on shore near Wollaston Island, we pulled alongside a canoe with six Fuegians. These were the most abject and miserable creatures I anywhere beheld. On the east coast the natives, as we have seen, have guanaco cloaks, and on the west they possess sealskins. Among these central tribes the men generally have an otter skin, or some small scrap, about as large as a pocket handkerchief, which is barely sufficient to cover their backs as low down as their loins. It is laced across the breast by strings, and according as the wind blows it is shifted from side to side. But these Fuegians in the canoe were quite naked, and even one full-grown woman was absolutely so. It was raining heavily, and the fresh water together with the spray trickled down her body. In another harbor not far distant, a woman who was suckling a recently born child came one day alongside the vessel and remained there out of mere curiosity while the sleet fell and thawed on her naked bosom and on the skin of her naked baby! These poor wretches were stunted in their growth, their hideous faces bedaubed with white paint, their skins filthy and greasy, their hair entangled, their voices discordant, and their gestures violent. At night five or six human beings, naked and scarcely protected from the wind and rain of this tempestuous climate, sleep on the wet ground coiled up like animals. Viewing such men one can hardly make oneself believe that they are fellow-creatures and inhabitants of the same world … There is no reason to believe that the Fuegians decrease in number...."
UPDATE UPDATE UPDATE! GO TO PART TWO HERE! 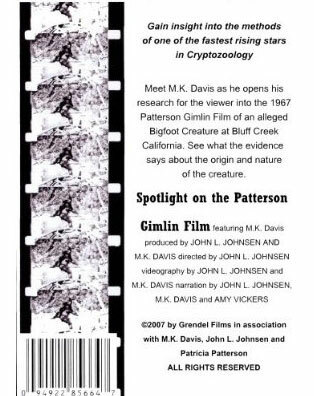 Henry May's "My Thoughts on The Patterson Gimlin Film Re M K Davis"
A You Tube video featuring the stabilization and other work MK has done. Mr. May presents an appreciation of the man, a disparagement of the theories. The last part featuring the non-MK stabilization done by the BBC. He uses A LOT of MK Davis' original stuff, and makes some really strange conclusions. Read one of ROGER KNIGHTS' very interesting works on the PGF and Greg Long's The Making of Bigfoot... HERE. SASQUATCH: LEGEND MEETS SCIENCE on YouTube! With good PGF content. Get the DVD from BFRO.net. BIGFOOT: A BEAST ON THE RUN, a documentary by David Thayer, and featuring MK Davis among others, has finally made it again to DVD. Unfortunately, Amazon is out of it! We'll be looking to find this long-Biscardi-delayed project (the narrator called Tom "bombastic," oh no!). For now, watch the trailer HERE. Where does one GET one of these??? Now three hours of content when adding the two hours of bonus features! Look for ANGRY BIGFOOT SPEAKS in the concluding segment of this MK DAVIS interview. COMING UP SOON! PART TWO, THE CONCLUSION, OF THIS INTERVIEW. MK is still covering the issue of humaness and culture. We're also hoping for answers on the hand print, the so-called massacre, MK's next projects, and MUCH MORE! Stay tuned.